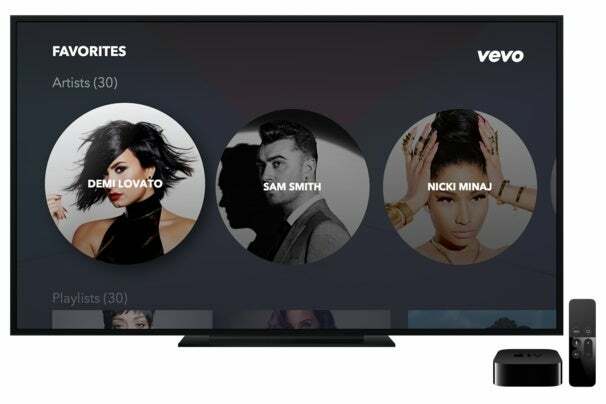 Vevo overhauls its Apple TV app to emphasize personalized music video playlists. In theory, Vevo should be one of my favorite streaming-video apps. I’m a big music fan, and Vevo is like a modern interpretation of classic MTV, serving up more than 150,000 music-video streams on demand. Yet whenever I install Vevo on one of my TV-streaming boxes, I find myself liking the idea more than the product itself. Unless you’re into the Top 40, sitting down with Vevo for a long listening session can feel like too much hassle. This hasn’t been a huge issue for Vevo the business, which gets much of its revenue by licensing music videos to other sites, such as YouTube. (The company is a joint venture between Universal Music Group, Sony Music Entertainment, Google, and Abu Dhabi Media.) But lately, the company has realized it ought to take more pride in its own apps. In April, Vevo brought on a new CEO, Erik Huggers, who previously tried (unsuccessfully) to reinvent TV under Intel, and the company is hiring many more product engineers to improve Vevo’s own apps. Now we’re starting to see the fruits of those efforts. After revamping its iOS app in November, Vevo has just released a similar update for Android. More importantly for this column, Vevo has given a major overhaul to its app for the latest Apple TV. And thankfully, the emphasis is on streaming better music with less effort. 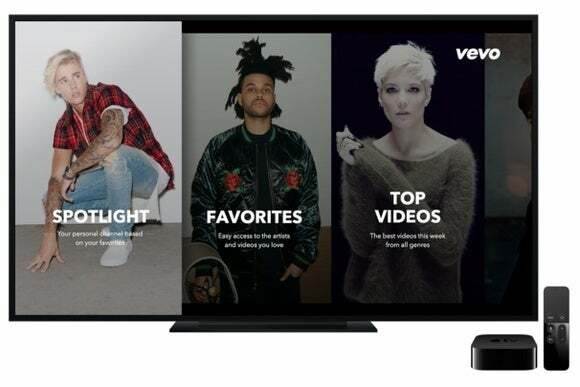 The centerpiece of Vevo’s Apple TV app is a new section called Spotlight, which automatically generates a video playlist based on your interests. You can pick favorite artists through the Apple TV app or Vevo’s mobile apps, and they’ll all sync together and feed the algorithm. Right now, the system is pretty bare-bones. There’s no way to filter Spotlight by genre, so users with eclectic tastes might find the playlist vacillating between vastly different moods. The initial setup process, in which you pick favorites from an endlessly scrolling list, can also be cumbersome if you’re not into the pop-heavy acts that Vevo tends to suggest. Still, the new app is a solid foundation on which Vevo can build. And when I raised my concerns to Hall, the response was to “Stay tuned.” He hinted that more ways to personalize are coming, including contextual or mood-based playlists along the lines of what Google Play Music and Spotify offer today. “We’re starting with Spotlight, that’s our first effort, and there’s going to be a lot more to come in terms of making Vevo as a whole way more tailored to your personal tastes and interests,” Hall said. To that end, the new Apple TV app also marks the beginning of the end for Vevo TV, a trio of live programmed channels that drew some obvious MTV parallels. Vevo first launched these channels in 2013, but never expanded beyond the basic pop, rap, and country stations. With the new focus on personalization, the new Apple TV app doesn’t include these channels at all. Algorithms and feeds aside, the new app’s menu system does a better job of making favorite artists, playlists and previously liked videos easier to access. It also includes some thoughtful uses of the Apple TV’s touchpad remote. While you’re watching a video, for instance, holding a thumb on the touchpad brings up a navigation overlay, and sliding your thumb left or right shows a preview of the previous or next track. As for technical details, music videos stream at up to 1080p resolution, with 128kbps/44.1kHz AAC audio. In another nice touch, the Apple TV app now performs a bit of predictive pre-loading for some videos, reducing the odds that you’ll run into any buffering. Overall, the Apple TV app is a major departure from Vevo’s other connected-TV offerings, and it holds a lot of promise. Unfortunately, Vevo doesn’t have any immediate plans to overhaul its apps on other TV platforms, such as Amazon Fire TV, Android TV, or Roku. 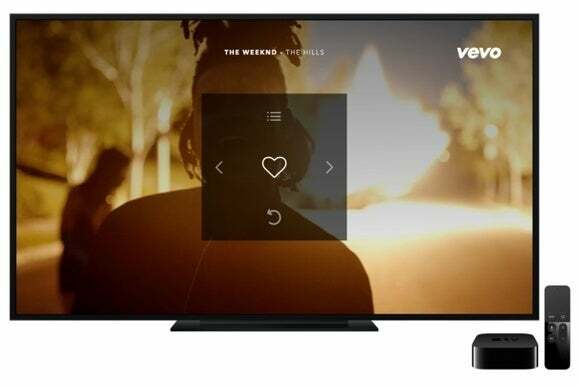 The reason Vevo went with Apple TV first, Hall said, is because of the capabilities and developer tools that Apple has built into its device. “It’s just an incredibly powerful modern box, and it’s one of the first times I think people have been able to make something that goes beyond the first-generation connected-box applications,” Hall said. He expects it’ll be a year or two before Vevo can offer the same features elsewhere. With any luck, Vevo’s attempts to offer your own personal MTV will be fully formed by then. This story, "How Vevo plans to get you hooked on music videos again" was originally published by TechHive.